SARASOTA, Florida - A Florida man has been charged with felony burglary of an occupied dwelling after police say he broke into a home in Sarasota, Florida and fell asleep on the couch. Officers with the Sarasota Police Department responded to the 3400 block of Tallywood Lane in Sarasota at approximately 8 a.m. on Saturday. The victim told police that she woke up around 7:20 a.m. and found 29-year-old Timothy Bontrager sleeping on her living room couch. When the woman asked him who he was and what he was doing in her house, he apologized to her. She told Bontrager that she was calling the police at which time he started walking around the living room and then left the house. When officers arrived, the woman told police that he had entered through an unlocked sliding glass door in the rear of the house. While speaking with police, the woman noticed that her wallet, driver’s license, credit and debit cards, and personal checks were missing from the table in her living room. A short time later, police observed a subject walking southbound on Beneva Road who matched the description that the woman had given officers. Police then took her to the location where she positively identified Bontrager. 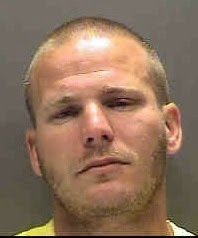 He was arrested and transported to the Sarasota County Jail.